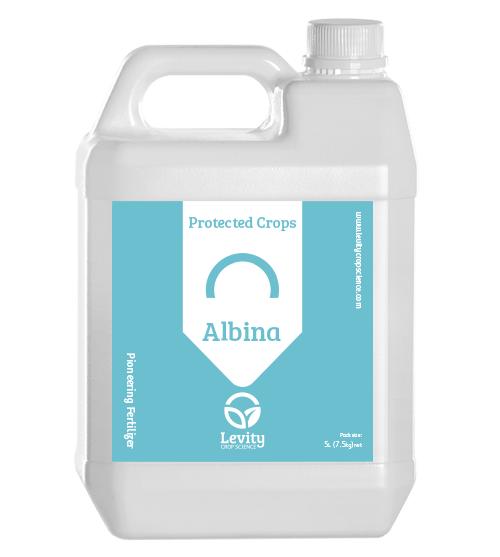 Albina for Protected Crops, is a pioneering new product that increases fruit-setting and reduces physiological disorders. Albina works by helping fruit absorb calcium, a nutrient that can improve quality but is poorly absorbed by fruit. Albina uses Levity’s LoCal chemistry, to stimulate calcium absorption where conventional products cannot. It will help improve flower set in all crops, reduce blossom end rot in tomatoes, peppers and eggplants, and reduce fruit abortion in cucumbers to higher standards using very low inputs. Application Rate: 1 l/ha foliar spray at start of flowering then at 14 day intervals until harvest.